Like so many people, I really love Thanksgiving leftovers! So many times I’ve heard people say they actually prefer the leftovers to the main event. Do you ever wonder why this is? Maybe it has something to do with the fact that all the work is done and you can just sit back, relax and enjoy the food. Well whatever the reason, let’s all agree that Thanksgiving leftovers rock! These turkey and cranberry panini are a great way to use some of those leftovers that are still hanging around in your fridge. If you don’t have any more leftovers, you can use sliced deli turkey or rotisserie chicken. Panini are Italian sandwiches. They are commonly pressed and toasted on a panini press and served warm. If you don’t have a panini press, no worries. You can toast the sandwiches on a grill pan or skillet and place another skillet on top that’s weighted down with a couple of cans. This panino (singular for panini) has a nice combination of savory and sweet flavors from the turkey and cranberry sauce and a hint of tanginess from the honey mustard. I used Muenster cheese in my panini but Fontina or any good melting cheese would also work well here. You can use slices of cheese but I prefer to grate the cheese because it melts better and is easier to distribute evenly across the sandwich. A handful of baby spinach adds a burst of color and fresh flavor. 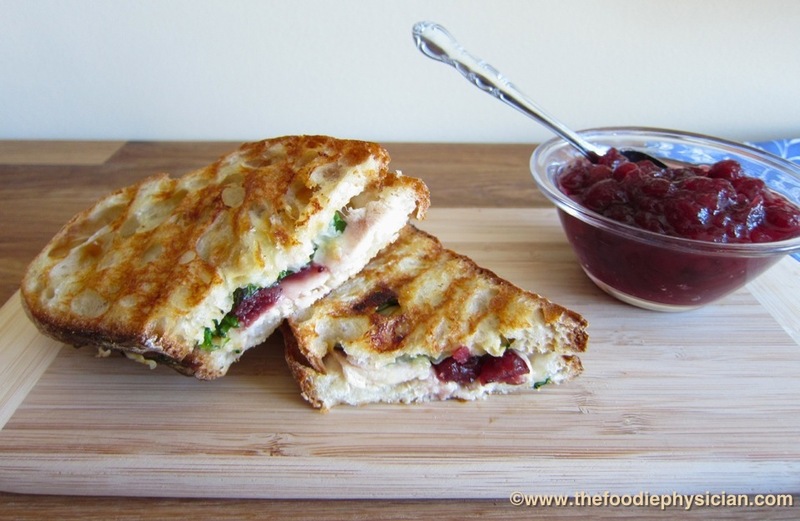 These panini are simple and delicious- Thanksgiving leftovers never tasted so good! Place one slice of bread on a cutting board and sprinkle on half of the cheese. Arrange the turkey slices on top of the cheese and then top with the cranberry sauce and spinach. Sprinkle the remaining cheese on top. Spread the honey mustard on the second slice of bread and close the sandwich. Heat a Panini press or a grill pan or skillet over medium heat. Brush the outside of the panino with olive oil on both sides and place it on the Panini press. Close the press and cook for 3-5 minutes until the bread is toasted and the cheese melts. If you don’t have a Panini press, place the panino on a grill pan or skillet and place another skillet weighted with a couple of cans on top. After 1-2 minutes, remove the skillet, flip the panino over and repeat the process on the second side. Cut in half and serve hot. Thanks Farah! Chili sounds awesome! Have a great weekend! Following you has been the highlight of my last week. So glad to have found you on the recipe redux group- Your instagram makes me salivate and now I am salivating again just thumbing through your archives. Can't wait to follow on and well…continue salivating. Wow, thank you for such kind words and high praise! I'm so glad our paths have crossed too, I'm really loving all of your posts!